Sky+ iPhone app to bring remote control feature | What Hi-Fi? 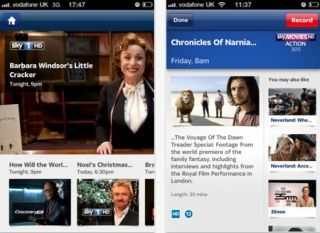 Sky has confirmed that an update to the Sky+ app for iPhone will soon allow you to use it as a remote control. The remote control functionality, currently limited to the Sky+ iPad app, allows you to use your device as a touchscreen remote for your Sky TV box. As well as scoring well on the 'impress your mates' scale, using an iPad or soon iPhone means you can browse the EPG, your recordings or change channel or volume without interrupting the full screen TV picture. The second screen experience on the iPad allows you to pause TV with a tap of the screen and swipe to rewind, fast forward or change channel. You can see how it works in this Sky video or read more about it in our original news story. All this functionality is now set to be available on the Sky+ iPhone app: another kick in the teeth for the traditional Sky TV remote control. Both the Sky+ app and the Sky Go app are available free on iOS and compatible Android tablets and smartphones.